With dividend investing you get a regular paycheque without lifting a finger. Past returns have averaged 16% a year. I got hooked on investing the day my first dividend cheque arrived in the mail. Like many investors, I enjoyed the thrill of watching the value of my stocks soar, but this was different. This was cold, hard cash delivered to me on a regular basis. It was like getting a paycheque—but someone else was doing the work. Dividends are typically paid out by large, mature companies such as CN Rail or BCE. Such companies often don’t need all their cash to fund growth, so instead of reinvesting all of their profits in the corporation, they pay some of it out directly to shareholders. Perhaps because they tend to be slow-and-steady companies, these stocks have never caught the public’s imagination in the same way that junior mining ventures or supercharged tech plays have, so you won’t see many of them touted on TV by the Jim Cramers of the world. But despite their unexciting veneer, dividend stocks may be the fastest route to riches out there for the typical investor. 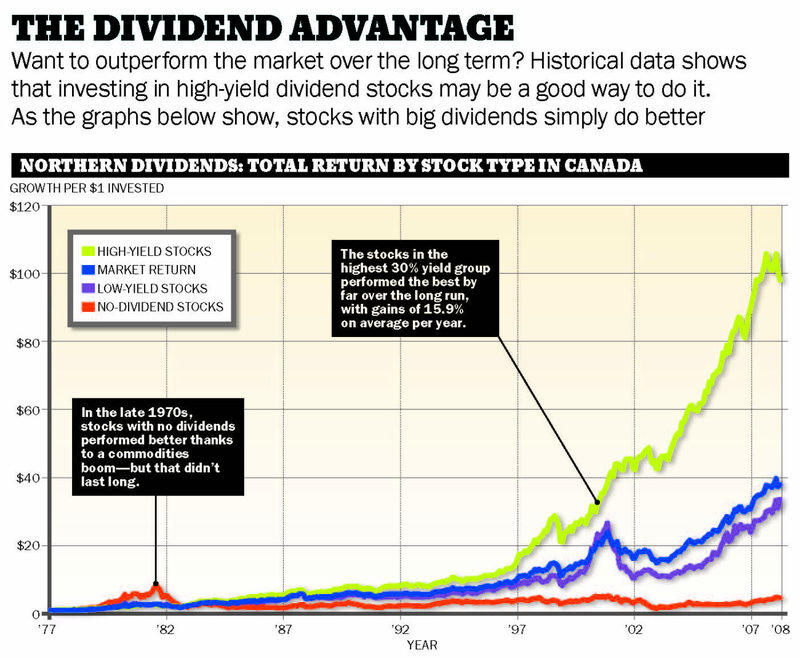 By sticking to companies that have the means to pay high dividend yields, you not only get the added bonus of a regular paycheque from your portfolio (now electronically deposited in your investing account), but studies show that you’ll likely enjoy a higher rate of return over the long run than the market typically provides. 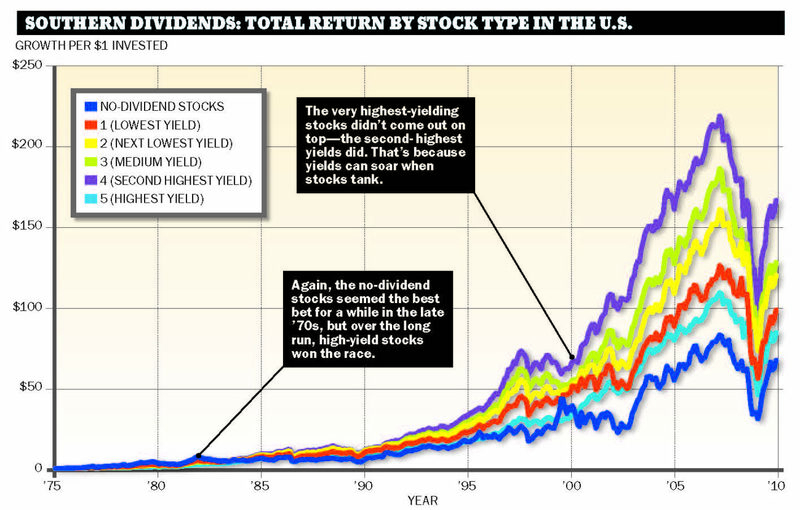 In fact, a surprisingly large fraction of the market’s real return comes from dividends. From 1975 to 2009 the MSCI World Index (a measure of the performance of stocks across the world) provided an average total return, adjusted for inflation, of 6.9% per year. Of that total, dividends accounted for 2.9 percentage points and capital gains 4.0 percentage points. In other words, dividends were nearly as important to overall returns as stock price gains—and many stocks don’t even pay them. So, why wouldn’t an investor stick to stocks that pay dividends? Why not indeed. In fact, many investors have done just that, and made themselves wealthy in the process. Here’s why you might consider becoming a dividend investor too. A small group of Canadians have done so well with dividend stocks that you might even call them dividend groupies (see www.dividendgrowth.ca for a peek into their world). You just have to take a look at the Northern Dividends to understand why they’re fans. The graph shows the performance of four portfolios from 1977 through to the end of 2007. The dark blue line tracks the performance of the market as a whole, which provided average returns of 12.4% a year. The orange line tracks a portfolio of stocks that don’t pay dividends at all, the purple line tracks stocks that pay the lowest 30% of dividend yields, and the green line tracks stocks in the highest 30% yield group. (The dividend portfolios were put together by Kenneth French, professor of finance at Dartmouth College, who rebalanced them on an annual basis. That is, he sold all of the stocks, ranked them by yield again, and bought a new crop of stocks each year.) As you can see, the high-yield group soundly trounced all the others—including the market as a whole—with spectacular gains of 15.9% on average each year. The low-yield group advanced 12.0%, and despite a burst of high performance in the late 1970s, the no-yield group climbed a mere 5.1%. It’s useful to get a broader perspective and consider how dividend investing has fared in other markets. The U.S. provides a good dollop of encouragement, as well as a cautionary tale or two. Let’s take a look at the growth of six U.S. dividend portfolios shown in the Southern Dividends graph. 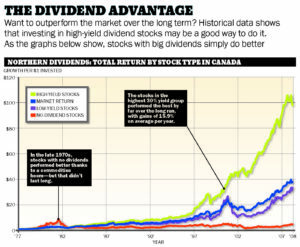 For easy comparison we selected roughly the same start date as the Canadian graph, but extended the figures to the end of 2009 to see how dividend stocks fared in the downturn. Much like on the Canadian graph, each line tracks a different portfolio of stocks and each portfolio was rebalanced annually. Once again the lowest line on the graph (in dark blue) shows the lackadaisical performance of non-dividend paying stocks, which generally lagged quite significantly over the long term (despite outperforming for most of the first 10 years). In this case, however, we divide the dividend-paying stocks into five equal groups by dividend yield. The orange line tracks the stocks with the lowest dividend yields. The yellow line tracks dividend stocks in the next yield bracket, all the way up to the light blue line, which follows the stocks with the highest dividend yields. Splitting dividend stocks up into all of these groups might sound a little complicated, but the extra effort leads to an important observation. Why aren’t the very highest yielding stocks the best? Problem is, if a company runs into trouble and its stock price sags dramatically then its yield will go up. That’s not a critical issue for dividend investors provided the dividend continues to be paid and the company eventually recovers. But in stressful times—such as those seen during the recent market collapse—many firms cut their dividends or eliminate them altogether. Even worse, some companies fail entirely. That’s why the wise dividend seeker should temper his lust for dividends and avoid bringing home the portfolio equivalent of a nasty rash. These days, if a stock yields more than 10%, alarm bells should go off. Such stocks may well have balance sheets riddled with worms and sagging income statements. Speaking of risk, prior to the most recent downturn, dividend stocks had a record of holding up quite well in bear markets. James O’Shaughnessy looked at the returns of large high-yielding stocks from 1951 to the end of 2003 in his book What Works on Wall Street. The worst market plunge over the period saw large stocks plummet 46.6%, but the top 50 large yielders only slumped 29.0%. He also found that stocks with moderate to higher dividend yields tend to be less volatile, which means they usually provide investors with fewer sleepless nights. Regrettably, high-yield stocks didn’t provide much of a buffer during the recent collapse—they generally declined in line with the overall market. Mind you, dividend stocks have been bouncing back quite nicely. Indeed, Canadian dividend stocks are, as a group, well on their way back to their old highs, which is a remarkable turnaround. Curious investors studying the recent downturn will be drawn to an interesting corner of the market. It turns out that stocks that have a habit of regularly increasing their dividends—called dividend growth stocks—fared relatively well during the collapse. Sure they declined, but not by nearly as much as the market, and they rebounded nicely. Personally, I’ve experienced extraordinary success over many years using dividend growth as a factor in several of my stock picking methods. Perhaps more convincingly, Ned Davis Research tracked the performance of dividend growth stocks in the S&P 500 from 1972 through to the end of 2009. The stocks that boosted their dividends on a year-over-year basis provided a performance advantage of a little more than two percentage points annually versus other dividend stocks. True to form, the growth group also gave investors a smoother ride with less volatility. Dividend growth aficionados measure growth over different time frames. Some investors simply look for companies that have grown their dividends over the last year. Others are even more demanding and look for dividend growth in each of the last 5, 10, or even more years. If you’ve settled on following a dividend oriented-strategy but you’re not quite ready to dive in and buy individual stocks, then opting for low-fee dividend ETFs or index funds is a great no-fuss way to enjoy the benefits of dividend investing. Just keep an eye on the fees because not all funds—or ETFs—are created equal. I like the well-regarded Vanguard family of ETFs, which is known for its low fees. The company’s Dividend Appreciation ETF (ticker: VIG) only costs 0.24% annually, which is relatively small compared to the performance advantage one might expect from dividend growth stocks. Similarly, the Vanguard High Dividend Yield ETF (ticker: VYM) only costs 0.20% annually. Both are good options for tracking U.S. dividend stocks. The high-yield fund focuses on 565 U.S. stocks that pay generous yields, whereas the appreciation fund tracks 142 stocks with good growth records. Many Canadian investors avoid foreign stocks and instead stick to Canadian names. Some are patriotic, but most appreciate the tax advantage Canadian dividends provide. Indeed, thanks to the dividend tax credit, some low-income taxpayers essentially pay no tax on Canadian dividends. For example, in 2009, if you lived in Ontario and your total income was $36,850 or less, your marginal tax rate on Canadian dividends would have been zero. If you use a computer to do your taxes then you can easily test out what your marginal rate would be if you added some dividend income. (A quick chat with your accountant may also be a good idea.) It’s important to compare investments on an after-tax basis: you might appreciate the guaranteed yield of government bonds, but on an after-tax basis, you’ll likely do better over the long-term with dividend stocks. If you’re keen on the tax advantages of Canadian dividends, a few ETFs can simplify your portfolio. For basic high-yield exposure, the iShares Canadian Dividend Index Fund (ticker: XDV, 0.50% annual fee) is worth considering. It tracks 30 large Canadian dividend stocks and has a heavy emphasis on financials such as banks and insurance firms. But it also holds a healthy dose of telecoms and utilities. Those looking to follow a dividend growth approach should check out the Claymore S&P/TSX Canadian Dividend ETF (ticker: CDZ, 0.64% annual fee) which holds 56 stocks. It’s also heavily invested in financials but less so than the iShares fund. The Claymore ETF is a little more diversified overall with big holdings in energy and consumer stocks. On the downside, the fees charged by the Canadian funds are much higher than Vanguard’s U.S. offerings, and the funds hold fewer stocks due to the smaller size of our market. (For instance, you can replicate about 51% of the iShares Dividend ETF by simply buying its top 10 holdings.) Relatively high costs and the smaller number of Canadian stocks are common reasons why many investors decide to build their own Canadian dividend portfolios. If you’re just starting a do-it-yourself dividend journey, I strongly suggest sticking to big profitable companies. You can still make mistakes with big firms, but the mistakes are less likely to be fatal because large companies tend to be more stable than smaller firms. You should also opt for some diversification. That way, the failure of a few stocks won’t be too painful. At a bare minimum spread your bets around and buy at least 10 stocks. (Personally, I’d want to build up a portfolio of 20 or more stocks over time.) If this requirement is too hard, because you don’t have enough capital to put to work, then it might be better to start off using low-fee dividend funds. To help get you started with Canadian stocks, I’ve constructed a mini-portfolio based on combining stocks with generous yields and dividend growth. For safety’s sake I’ll stick to larger stocks with market capitalizations (share price times shares outstanding) in excess of $1 billion. I’ll also pay attention to several additional safety factors. I’m also leery of companies that pay more in dividends than they earn—particularly if this situation persists for a long time—because such firms often cut their dividends. As a more subtle safety factor, I want companies to generate more cash flows than earnings. Finally, I’ve selected a maximum of two stocks from any particular industry group in an effort to enhance diversification by industry. 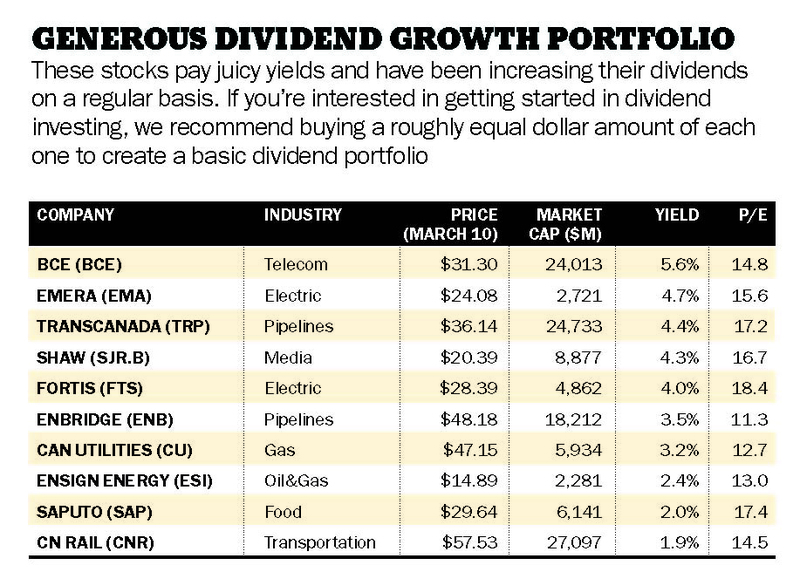 The Generous Dividend Growth Portfolio highlights the highest yielding stocks that pass the initial tests and have increased their dividends both over the last year and over the last five years. If you’re just starting out, consider buying roughly equal dollar amounts of each stock to form a basic dividend portfolio. More experienced investors might want to fill in industries that are currently underrepresented. For instance, if you don’t own a railway, CN could be a good addition. Before you rush out to buy any stock, however, you should do your own due diligence. Make sure the situation hasn’t changed in some important way. Read the firm’s latest press releases and regulatory filings. Scan newspaper stories to make sure you’re aware of any recent developments. It’s important that you’re comfortable with the overall strategy. The dividend approach isn’t likely to make you a mint overnight—and holding dividend stocks can be about as exciting as watching grass grow. But if you’ve ever gone on vacation, you’ve likely been amazed by just how much your grass can grow in a week. In the end, I can assure you, the effort will be well worth it.